Is the Consumption of Dog Meat Legal in Switzerland? 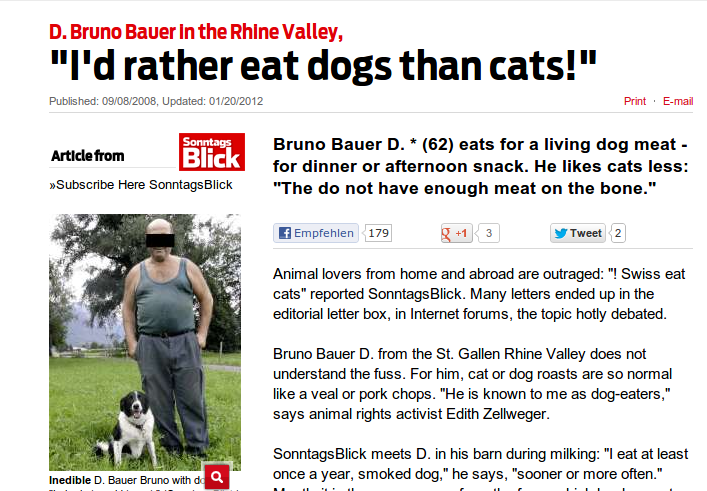 I was very surprised to learn that Switzerland allegedly does not object to people eating dog meat if they so desire! I found the following on the Web. Popular Swiss recipes for dog meat include gedörrtes Hundefleisch served as paper-thin slices, as well as smoked dog ham, Hundeschinken, which is prepared by salting and drying raw dog meat. 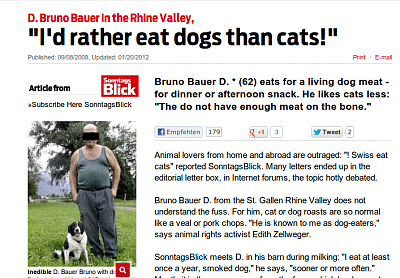 According to the 21 November 1996 edition of the Rheintaler Bote, a Swiss newspaper covering the Rhine Valley area, the rural Swiss cantons of Appenzell and St. Gallen are known to have had a tradition of eating dogs, curing dog meat into jerky and sausages, as well as using the lard for medicinal purposes. Dog sausage and smoked dog jerky remains a staple in the Swiss cantons of St. Gallen and Appenzell, where one farmer was quoted in a regional weekly newspaper as saying that "meat from dogs is the healthiest of all. It has shorter fibres than cow meat, has no hormones like veal, no antibiotics like pork." A few years earlier, a news report on RTL Television on the two cantons set off a wave of protests from European animal welfare activists and other concerned citizens. A 7,000-name petition was filed to the commissions of the cantons, who rejected it, saying it was not the state's right to monitor the eating habits of its citizens. The production of food from dog meat for commercial purposes, however, is illegal in Switzerland. Re: Is the Consumption of Dog Meat Legal in Switzerland? I believe that it is not illegal per se. Provided things are dome humanely, I am not in a position to criticize what other people eat, regardless of how revolting I find it. Yes, it's legal to eat. But it is illegal to sell. Quoted from Tier Im Recht Transparent, chapter 2.1.13 'Darf Heimtiere gegessen werden? ", page 82. "Ein ausdrückliches gesetzliches Verbot für den Verzehr von Heimtierfleisch gibt es nicht." Roughly: there is no specific law banning eating a pet animal. "Das Fleisch von Heimtieren darf höchstens für den Eigengebrauch verwendet, jedoch weder verkauft noch unentgeldlich abgegeben, angepriesen oder gelagert werden. Der eigen gebrauch beschränkt sich dabei auf die sogenannte Kernfamilie, das heisst auf die im selben Haushalt lebenden Familienangenhörigen. Bereits die Abgabe von Heimtierfleisch an weitere Verwandte Freunde usw. oder eine Einladung zu so einem "Festmahl" ist verboten." Roughly: Eating pets is at most allowable for one's own use, however meat from pet animials may not be sold, given away free, advertised, or stored. Own use is limited to the nuclear family, that means, to people living in the same household. The delivery of pet meat to friends or relatives, or invitation to a 'feast' is forbidden. In principle, Swiss Animal Welfare Laws do not protect the life of an animal, but rather the welfare of that animal during it's lifetime. An animal must be kept free from pain, from suffering, from fear, from injury while alive - but unless a protected species, an animal may (in general) be killed provided one follows the laws preventing unnecessary suffering. und Katzen, Wildtiere wie Papageien und andere Psittaziden, exotische Vögel, Frettchen, Affen, Grosskatzen, die meisten Nagetiere, exotische Frösche, nicht essbare Fische etc." Roughly: For food production not allowed: Pet animals such as dogs and cats, wild animals such as parrots and other Psittacines, exotic birds, ferrets, monkeys, big cats (lions, tigers, etc. ), most rodents, exotic frogs, inedible fisch, etc. Last edited by meloncollie; 22.10.2012 at 19:30. They also eat cat meat here in certain valleys. Also in Italy. Meloncollie, may I copy your post No 3 to a friend in the UK please? Gosh, this world is full of simple-minded, culturally ignorant people. Do you approve dog meat eating? If so you should be ashame of yourself. Sorry but you are the barbarian, primitive and ignorant one, not me. Gosh, this world of full of simple-minded, culturally ignorant people. I may touch some nerves here, and I'm a dog person. Had one growing up too. But why should people be allowed to eat Beef but not dog? Isn't it their own prerogative which meat they eat provided the animal dies humanely? Basically, if you are, for example, a cat person who adores cats, doesn't mean the rest of society has to be a cat person and love cats the way you do to a point where you are forced to restrain from its consumption. Which animal you decide to love as a pet is your own decision and should not be forced upon the rest of us. I will personally not eat dog or cat, but I also dont find it repulsive if someone else does, if they happen to like it. As long as a dog, cat, cow, sheep, chicken, horse, parrot, trout, iguana, or any other non-endangered animal is humanely treated, then yes, I approve. It's not my place to determine which animals are acceptable to eat and which aren't. In Europe, cats, dogs and horses have a very special relationship with humans in our culture, they are considered as members of the family and for me it's like cannibalism to eat them. I can't even imagine that people eat them in civilized countries. What part of Europe are you talking about? Here in Switzerland, horsemeat is available almost anywhere. What "civilized" country are you from? Do you know how to read?Isn't Switzerland a civilized country? What part of Europe are you talking about because here in Switzerland, horsemeat is available almost anywhere. What "civilized" country are you from? To those that have them as pets. To others who don't have them, they are just another animal. Sorry but I can't. I can imagine that some tribes in Africa who don't have a clue about western civilization can eat them, but educated people, who are aware of the western culture, even through movies...I don't find it normal, it's disgusting and barbaric. Why should eating horses, cats or dogs be any different to cattle, sheep or lamb. Humans like eating meat so other then pre conceived perceptions they are all meat, there are even places that eat people in the jungles of this earth.